We finally took down the tree and put away all the Christmas decorations today. Don’t worry. It isn’t a live tree, so we weren’t creating a fire hazard by leaving the tree up so long. In fact, it’s the flame retardant quality of a fake tree that we like so much, since we burn real candles on our tree every year. Yes, we do. 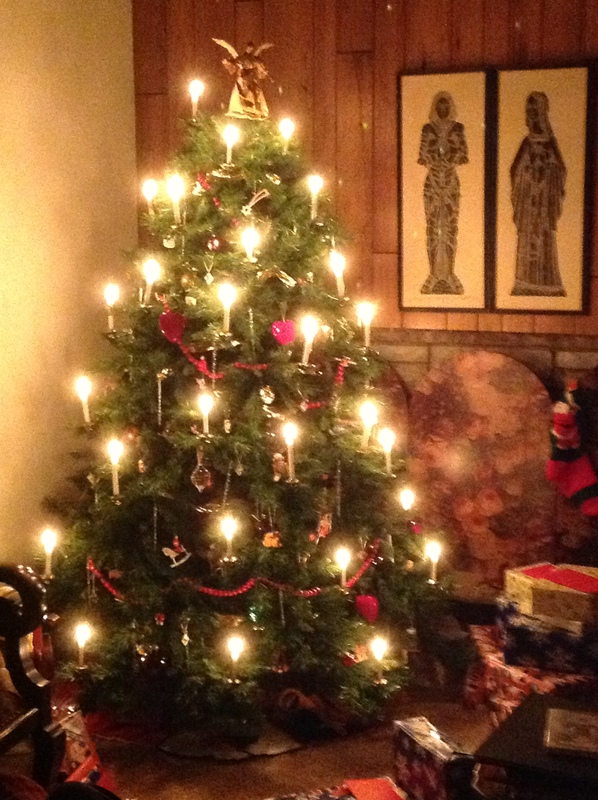 Maybe only a couple of times, unless we have guests during the Christmas season, but we never fail to light the tree the first night it is up, and Christmas Eve is the other non-negotiable candle-lighting event. Other than that, we usually only light the tree for company. And that is why we waited until now to take everything down – we had company that couldn’t come until well after Epiphany. What a great excuse to leave the tree up another week or two, right? I’ll take any excuse I can get. To tell the truth, I would leave the house decorated for Christmas right up to Lent, if I thought I could get away with it. (One year, we almost did!) The place always looks so stark and empty after the decorations are put away. It looks …. colder. Even when the tree isn’t lit, it adds warmth to the room. When it’s gone, I miss more than the candle glow. I miss the tiny sparkle of glass icicles, the memory attached to each ornament that hangs there. I miss the expectation, the hopefulness, the anticipation of joy. That is why there are two items that remain in place, while everything else is packed away for another eleven months (okay, ten and a half months). One is the wreath at the front door. The first year we lived in Minnesota, we were amused to see Christmas yard decorations and light displays still evident through February. We chalked it up to the fact that no one wants to get out in the snow in sub-freezing weather to take down lights or the reindeer from the front lawn. But the wreaths hanging on everyone’s door, sometimes right into March, completely befuddled us. What’s so hard about taking down a wreath, after all? Not a thing. That’s the point. It isn’t laziness; it’s defiance. That wreath will keep looking fresh all through the winter, if you just leave it alone. It’s a beautiful paradox: frozen greenery. Think about it. Leaving the wreath on the door says, “You can’t beat me, Winter. I will stay green no matter what.” And we do. We may be frozen, but underneath the ice, we are still green. The other thing that stays in place is the Christ candle from the Advent wreath. The candle burns on Sunday nights, if we remember to light it, and stays in place until it’s time to get a new one for the next Advent wreath. This Christ candle carries us through Lent, into Easter, through Pentecost and the long season of Ordinary Time. It is a reminder that the Light of the World has broken into our lives, and will not be extinguished, no matter what. The expectation, the hopefulness, the anticipation of joy is still present every day of the year, for God is with us. We are still green. This entry was posted in Epiphany, Life, Uncategorized and tagged anticipation, Christmas decorations, Christmas tree candles, Emmanuel, Epiphany on January 19, 2013 by pastorsings.